2.4G 4CH Nano Low Voltage Compatible Receiver With Brushed ESC For DSM2. This little guy weighs 1.4 grams, Input Voltage: 3V – 5.5V. 4 channels. Dimension: 21.3×11.9×5.8mm this receiver will have to be used with a low voltage servo running a 1S lipo battery. 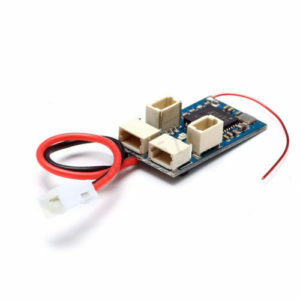 Bulit-in 2A brushed ESC,supported external brushless ESC, no programing needed. The receiver signal can stay stable even if the voltage is 2.5V.